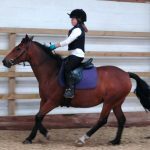 During the school holidays we run courses for children who want to improve their riding and get stuck in to the daily care of our ponies. 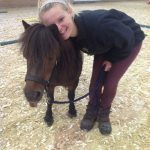 A typical day would be catching and bringing in the pony, grooming them, preparing their stable, feeding them, cleaning their tack, riding them (1 hour lesson per day), mucking them out and helping with other jobs around the yard. Other horse related activities and games will also be going on through the day, including training in our pony agility course. 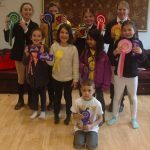 On the Friday afternoon of each week, we hold a fun competition showcasing the skills the children have learnt through the week with rosettes and prizes for all. Parents are welcome to come along and join in the fun at this event. 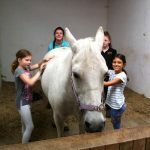 Children under 10 are assisted at all times by our volunteers, whilst over 10s are supervised but given the responsibility to spend the day working with their pony as if it was their own. Hot food and drinks are available in our cafe, or provide a packed lunch.